A fall is defined as “an unintentional loss of balance that leads to failure of postural stability". Approximately one in three adults over age 65 fall every year, often resulting in injuries that include wrist fractures, hip fractures, or head-trauma. A fall injury can cause a significant burden on your family and can increase your odds of ending up in a nursing home by 10 times! In older adults, falls are the number one cause of admission to the hospital and accidental death. Even the fear of falling again can make people restrict their activities, thinking that they’re reducing their risk, but that deconditioning may actually increase fall risk. Why do we fall more as we age? There are many different factors that ‘gang up’ on us as we age, increasing our risk of falling. Our flexibility, joint health, strength, conditioning, and reaction time declines. We may not see or hear as well, or have the sensation and mobility in our feet like we used to. Other medical conditions that affect balance like diabetes or Parkinson’s may have developed, and other movement disorders, brain changes, or reduced blood flow to the brain contribute. Even being on four or more medications increases your fall risk. Many of these factors aren’t surprising, but one you might not be aware of is inner ear dysfunction. Problems with the vestibular organ in the inner ear(s) is one of the most common contributors to decreased balance. These organs are responsible for detecting head position, as well as maintaining clear vision when the head is moving, and declining function of the vestibular system relates strongly with falls. There are numerous vestibular conditions that can create dizziness at any age, increasing your fall risk. If your balance is reduced and you’re dizzy, you’ve got a 12-fold increase in your odds of falling. Common vestibular conditions include inner ear infection/trauma, Meniere’s Disease, Vestibular Migraine, and BPPV. BPPV (Benign Paroxysmal Positional Vertigo) is the most prevalent inner ear problem and the most common cause of vertigo, especially in older adults. This gives people a brief, spinning-type dizziness that is triggered when they move their head into certain positions. It can occur after trauma or infection, but mostly just happens ‘out of the blue’. This condition also decreases balance and increases fall risk, but is actually quite straightforward to diagnose and correct with Vestibular Rehabilitation. This might sound like a lot of doom and gloom, especially since some of the age-related risk factors aren’t under your control. However, there are numerous steps you can take to reduce your risk of fall. 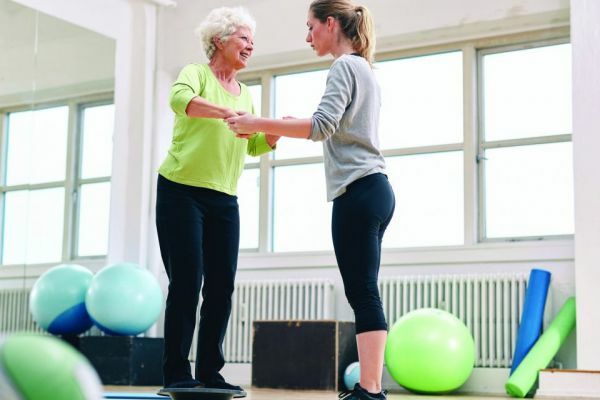 Maintain fitness as you age: There are countless activities or classes to help you maintain strength, flexibility, and conditioning. If you have muscle, joint, or cardiovascular issues that make this difficult, see a medical professional for assessment and treatment. Keep your senses sharp: Maximizing your visual and auditory input will improve your appreciation and interaction with the world around you, improving your quality of life while reducing your fall risk. Get regular check-ups for your sight and hearing. Manage medical conditions: Other health issues that increase fall risk, like diabetes, Parkinson’s disease, and cardiovascular problems, need to be under control. Stick to your medications, follow treatment recommendations, and follow up with your Doctor if things are worsening. Review your medications: Periodically talk to your Pharmacist and Doctor about a medication review so that you aren’t taking more than you really need. Keep your Doctor informed of your symptoms: Let your Doctor know if you are having dizziness and consider seeing a medical professional trained in Vestibular Rehabilitation to assess and/or treat your dizziness disorder. Vestibular Rehabilitation is effective at reducing/eliminating dizziness, and improving balance in people, and is just as good when you are older as when you are young. No matter what has you or your loved one off-balance, the Vestibular Therapists at Lifemark clinics coast-to-coast have many tools for measuring balance, calculating fall risk, evaluating the vestibular system, and reducing dizziness and falls. Find a therapist near you to help you with your dizziness and get you back to life.